If you have been injured in a head on collision or have lost a loved one in a fatal car accident, it is important to have an experienced attorney standing up for your rights. If your accident was the result of another driver’s careless or negligent actions, you may pursue compensation for the losses you have suffered. 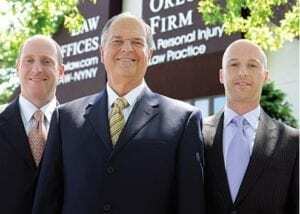 At The Orlow Firm, our attorneys have close to 70 years’ combined experience handling car accident injury lawsuits for clients throughout New York. We offer exceptional legal service and personal, attentive service to our valued clients. Contact our New York City law firm today to speak with an experienced New York head on collision attorney. Common injuries resulting from a head on collision include head injuries, spinal cord injuries and seatbelt injuries which damage the chest and ribs. Lacerations from broken windshields are also common. Because of the combination of speed and point of impact which are involved in head on collisions, they all too often result in fatal injuries. Our lawyers are adept at determining the cause of car accidents, to establish how the accident took place and who was at fault. We will put our skill and experience to work for you, to help you pursue compensation for the losses you have suffered. Have you or someone close to you been injured in a head on collision? If so, contact our Bronx car accident lawyers today for information regarding your legal rights. Call (646) 647-3398 to speak with an attorney at the Orlow Firm.